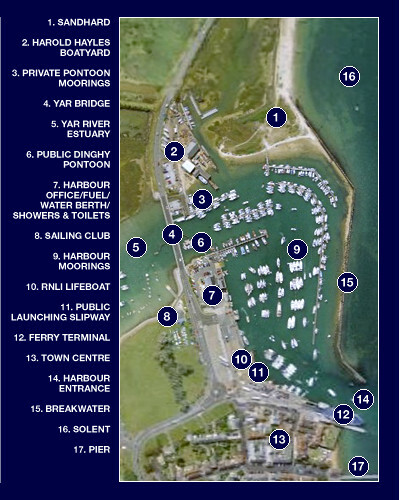 The harbour is accessible at all states of the tide (dredged 2 metres below chart datum). It is close to the Needles and English Channel and makes it ideal port of call for those entering or leaving the Solent. There is a strong tidal flow around the pontoons and near the Yar Bridge. Please contact us for help in berthing when entering the harbour. Winter operation: Minimum half hour's notice, by arragement with Harbour Office on VHF Ch 68 or Harbour Office Tel (01983) 760321. Bridge requests and radio messages for bridge opening are handled on VHF Ch 68, callsign Yar Bridge. Fuel and water berths are available at the South Quay.